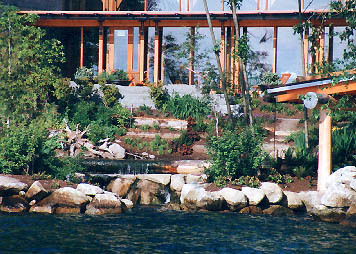 The former big boss of Microsoft does have a nice little pad down on the shores of Lake Washington. Bill and Melinda Gates' $150 million house. Annual taxes are over $1 million. Much of the house is built underground into the hill, so the house looks smaller than it actually is. Unfortunately the hidden section underground did not escape the taxman's view; Bill paid over a million dollars last year on property taxes. A stream flows through the property. The pool room is in the background.